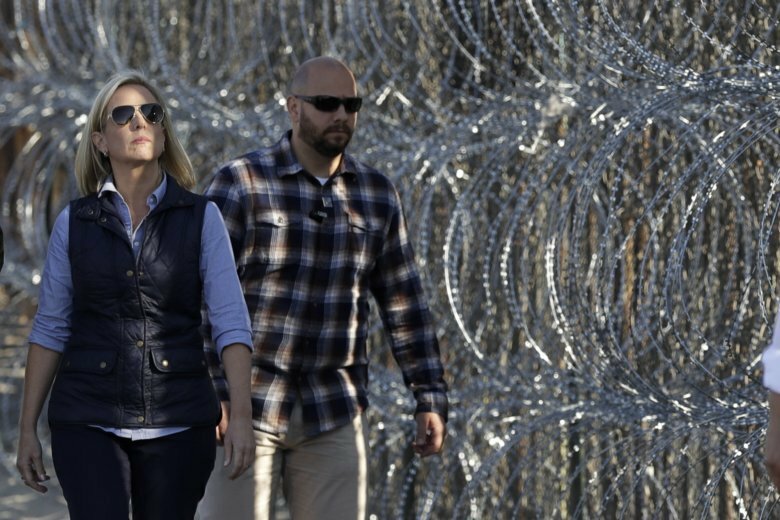 Homeland Security Secretary Kirstjen Nielsen says an appeal will be filed on the decision by a judge to bar the Trump administration from refusing asylum to migrants who cross the southern border illegally. Speaking in San Diego, Nielsen said it would be filed as soon as possible. She said the ruling was “dangerous” for the country. Press Secretary Sarah Huckabee Sanders railed against the California court that issued the ruling. The judge sided with civil rights groups that filed a lawsuit on the new regulations saying immigration law clearly states any migrant can claim asylum no matter how they arrived in the country. Sanders said the administration would take “all necessary action” to defend the decision to refuse asylum to people who cross between borders. President Donald Trump is railing against courts in a western U.S. region that have ruled against his administration. Trump was asked Tuesday about a judge’s ruling from San Francisco that temporarily blocked his administration’s effort to deny asylum to migrants who enter the U.S. illegally. The government has not said whether it would appeal, but if it did, the appeal would be filed with the U.S. Court of Appeals for the 9th Circuit. It includes Alaska, Arizona, California and Hawaii. Judges in the region have also said administration may not detain families indefinitely and ordered a strict timeline to reunify migrant families that had been separated. But earlier this month, a judge ruled in favor of the Trump administration in a lawsuit over a California law meant to stop land sales. A Nicaraguan who has been waiting for a month to ask for asylum at a U.S.-Mexico border crossing says he’s going to wait a little longer. Byron Torrez says he knows a federal judge in California temporarily blocked the Trump administration’s effort to deny asylum to people who enter the U.S. without permission. But the 28-year-old businessman, who has scars on his face from an acid attack while he was protesting against the Nicaragua government, says he doesn’t want to do anything illegal. The judge sided with civil liberties groups who argued it was against immigration law to deny asylum even if a migrant crossed the border illegally. Trump administration officials say the president has a right to defend the border. The Justice Department has not said yet whether they will appeal the ruling, which is in effect for a month. A federal judge has temporarily barred the Trump administration from refusing asylum to immigrants who cross the southern border illegally. U.S. District Judge Jon S. Tigar issued a temporary restraining order Monday after hearing arguments in San Francisco. President Donald Trump issued a proclamation Nov. 9 denying asylum to most border crossers as a response to the migrant caravans he decried before the November midterm election. The administration directed asylum seekers to enter at one of the 26 official border crossings with Mexico. Legal groups sued hours after the proclamation was issued, arguing U.S. law clearly allows someone to seek asylum regardless of how they enter the country. Trump used the same powers he used last year to impose a travel ban that was ultimately upheld by the Supreme Court. U.S. District Judge Jon S. Tigar did not immediately rule Monday on the groups’ request to stop the administration from enforcing the ban.